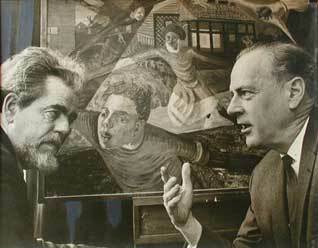 Harley Parker and Marshall McLuhan with "Flying Children". 1973 Held the initial Chair for the William A. Kern Institute Professor of Communications at the Rochester Institute of Technology, Rochester, N.Y.
Harley Parker lectured extensively in Canada, America, Australia, Europe, Africa and Japan; his audience included groups related to: art, politics, education and religion. He co-authored, with Marshall McLuhan, Through the Vanishing Point: Space in Poetry and Painting (Harper & Row, New York, 1968). He designed several works for Professor McLuhan, the last one being Counterblast (Harcourt-Brace & World Inc., New York 1969). Over his career Parker published widely, including papers in Harvard Art Review, Art International, Canadian Art, 1973 Annual, National Association for Studies in Education, Chicago, contributor to This Cybernetic Age, Ed. Don Toppin, Information Incorporated Pr. New York, 1969, Living in the Seventies, Ed. Allen M. Linden, Peter Martin Associates, Toronto, 1970 and was a contributing author to the 1974 Year Book, The National Society for the Study of Education. Work in progress: Museums Are Today. Numerous galleries have exhibited the paintings of Harley Parker, among them are: Beau Xi Gallery, Vancouver & Toronto, Prince Arthur Gallery, Toronto, and the Moos Gallery, Toronto. His paintings are represented in many private collections. All artwork is copyright by the Family of Harley Parker, 2006.